From Zingerman’s Bakehouse, a rich and buttery sour cream coffee cake with a cinnamon-nut swirl. A classic breakfast cake is one of the handiest things to have in your baking repertoire, and this sour cream coffee cake from the famous Zingerman’s Bakehouse in Ann Arbor, MI is one of the very best. Featured on the cover of the Zingerman’s Bakehouse Cookbook by Amy Emberling and‎ Frank Carollo (Chronicle Books, 2017), the recipe is a treasure that’s worth the cost of the book alone. The authors write, “This is our most popular coffee cake and possibly our most popular sweet item…As you can see, it is full of tasty fat – half a pound of butter, half a pound of sour cream, and three whole eggs – which yields a mellow and moist cake crumb.” But what makes it truly special is the contrasting flavor and crunch of the cinnamon-nut swirl that runs throughout. And the cake lasts: you can store it in a covered container on the countertop for up to two weeks (but good luck keeping it that long!). To begin, make the cinnamon-walnut swirl. Preheat the oven to 325°F and set an oven rack in the middle position. Toast the walnuts on a rimmed baking sheet until they’re fragrant and golden brown, 10 to 15 minutes. Let cool, and reduce the oven temperature to 300°F. In a small bowl, combine the walnuts, brown sugar, and cinnamon. Mix until combined, then set aside. In another bowl, whisk together the flour, baking soda, and salt. Set aside. In the bowl of an electric mixer fitted with the paddle attachment or beaters, combine the sugar and butter. Beat on medium speed until pale and fluffy, about 3 minutes. Add the eggs, one at a time, beating well after each addition until the mixture is homogenous. On low speed, mix in the sour cream and vanilla. The batter will look a little curdled at this point; that’s okay. Scrape down the sides and bottom of the bowl to make sure all of the ingredients are evenly incorporated. And mix on low speed until the batter is smooth and homogeneous. Sprinkle half of the cinnamon-walnut mixture evenly over the batter. Cover with another 1/3 of the remaining batter, using a spoon or spatula to spread the batter evenly over the pan and to the edges. Sprinkle the remaining nut mixture evenly over the batter. Cover with the remaining batter, spreading it evenly over the nut mixture. Bake for 65 to 75 minutes, or until a cake tester comes out clean. Cool the cake in the pan for 15 minutes. Do not let the cake cool in the pan for much longer than this or the brown sugar in the streusel might stick to the sides of the pan and make it difficult to release the cake. Place a wire rack on top of the Bundt pan and then invert the pan to release the cake. Let the cake cool completely before serving. The cake will keep well in an airtight container at room temperature for up to a week. Enjoy! Make the Cinnamon-Walnut Swirl: Preheat the oven to 325°F and set an oven rack in the middle position. Toast the walnuts on a rimmed baking sheet until they’re fragrant and golden brown, 10 to 15 minutes. Transfer the walnuts to a plate to cool. In a small bowl, mix together the walnuts, brown sugar, and cinnamon. Set aside. Reduce the oven temperature to 300°F. Spray a 9- or 10-in Bundt pan with nonstick cooking spray and dust with flour. Tap out any excess flour. Alternatively, spray the pan with a nonstick spray with flour in it, such as Baker's Joy or Pam with Flour. In the bowl of an electric mixer fitted with the paddle attachment or beaters, combine the sugar and butter. Beat on medium speed until pale and fluffy, about 3 minutes. Add the eggs, one at a time, beating well after each addition until the mixture is homogenous. On low speed, mix in the sour cream and vanilla. The batter will look a little curdled at this point; that's okay. Scrape down the sides and bottom of the bowl to make sure all of the ingredients are evenly incorporated. Gradually add the flour mixture and mix on low speed until the batter is smooth and homogeneous. Scoop 1/3 of the batter into the prepared pan. (It won't seem like enough, especially if you're using a 10-in Bundt -- that's okay. Just do your best to smooth it into an even layer with a spatula or back of a spoon.) Sprinkle half of the cinnamon-walnut mixture evenly over the batter. Cover with another 1/3 of the remaining batter, using a spoon or spatula to spread the batter evenly over the pan and to the edges. Sprinkle the remaining nut mixture evenly over the batter and cover with the remaining batter, spreading it evenly over the nut mixture. Bake for 65 to 75 minutes, until the cake is golden and a cake tester comes out clean. Cool the cake in the pan for 15 minutes. Do not let the cake cool in the pan for much longer than this or the brown sugar in the streusel might stick to the sides of the pan and make it difficult to release the cake. Place a wire rack on top of the Bundt pan and then invert the pan to release the cake. Let the cake cool completely before serving. The cake will keep well in an airtight container at room temperature for up to a week. Freezer-Friendly Instructions: The cake can be frozen for up to 3 months. After it is completely cooled, double-wrap it securely with aluminum foil or plastic freezer wrap, or place it in heavy-duty freezer bag. Thaw overnight on the countertop before serving. This coffee cake is gorgeous and so so tasty. This recipe is similar to one I’ve made for years and I like some of the differences in Jen’s recipe, but I like some of the suggestions in the other one. Tip #1: Use all-purpose flour, not cake flour (as my other recipe suggests). APF gives the sponge a wonderful, light texture that compliments the denser ripple of nut & brown sugar. Tip #2: Use pecans instead of walnuts. I lightly toast pecans and then chop them up very finely in this recipe. Walnuts can have a bitter taste whereas pecans add a bit of sweetness when they’re toasted. Tip #3: I make a little trough in the batter with a spoon to lay the nut/sugar mixture into, then cover with more batter and repeat. The idea is to try to prevent the sugar from touching the pan and caramelizing on the hot bundt pan. Even if the pan is prepared, the sugar will become chewy and take away from the rest of this wonderful cake. Plus, it can cause the cake to fall apart when it’s cut and placed on the plate. I have made this several times since you posted this recipe and it always turns out perfect. I even made it and mailed to a sick friend and they said it arrived in great shape and tasted as if it had just come from the bakery. This is an absolutely perfect cake. Look, texture and taste. I wish I could make it once a week! The recipe came together quickly and was baked in about 65 minutes. The only substitution I made was adding nutmeg and a bit more cinnamon than it calls for in the filling mixture. The cake had great flavor and reminded me of a cinnamon coffee cake my grandmother use to make. This recipe has moved to the top of the coffee cake rotation. This truly is a terrific cake. The only change I made while making it was to substitute pecans for the walnuts, a personal preference. The cake is moist, light and delicious and it stays fresh for days at room temperature. I also cut 3/4 of it into three large sections, wrapped each individually and froze them. They were still perfect when thawed. This cake is great for a special occasion or just to have on hand for unexpected company. I have used many of Jenn’s recipes and have always been delighted with the results. I made this cake for myself and my spouse for a treat to have with our morning coffee and tea.It was rich and delicious,just the right amount of walnuts,cinnamon and brownsugar.It caught my eye because of my love of walnuts!My two sisters visited and loved it too,asking for the recipe so they could bake it for their families.Delicious! What a great coffee cake or in my case an anytime cake. I followed the recipe exactly except I did not divide the cinnamon/nut swirl – I had only one line of it in the middle. It was super moist and very flavorful. This will become one of our regulars. We did not use the walnuts because we don’t care for nuts in our food. This recipe does take a bit of time to prepare. Having multiple mixers would make the job easier. My daughter asks for this item to be made for all special occasions. We ate this for dessert and breakfast. Coffee cake can be eaten with eggs and sausage or bacon. The taste is very sweet for our liking so I used natural cane sugar instead. Hi Jenn! Question: I have a Nordic Ware Platinum Collection Anniversary Bundt Pan which measures 10.5 x 10.5 x 4.5 vs. yours which is 9 x 9 x 4, so wondering: Could I just do one layer of filling or maybe a layer of filling on the bottom, one in the middle? Realize I’d have to flip w/in 5-10 minutes of removing from oven? But then yummy topping and middle to enjoy? I don’t have a stand mixer. Will a hand mixer work just as well or do I have to make adjustments re: time? Sure! It may take just a few minutes longer with a hand mixer, but it will work perfectly fine. Hope you enjoy! Sounds yummy but I’m not a huge fan of walnuts and love pecans. Can you follow the exact same recipe but just substitute pecans? My bundt pans are cast iron or a non stick cast aluminum. It doesn’t look like yours is that heavy. Would mine require adjustments? Which should I use? I really want to make this. I want to bake this cake. However, is 1/2 tsp of baking soda correct? It seems to be such a small amount. Yep, Sandra, that’s correct. Hope you enjoy! I made this and it was so easy and with a spectacular result as has been the case with all of your other recipes that I have tried so far — so moist and delicious. Very picky partner described it as “transformational”. At the same time, for some reason that is beyond me, I was asked if I could bake this again but without the Walnut filling. I wanted to ask you if you would recommend changing anything in the batter recipe (or baking time) if I were to skip the filling. Thank you so much for yet another amazing recipe. So glad you enjoyed this! I think you could make it without the swirl. You could add the cinnamon from the swirl into the batter, but other than that I wouldn’t fiddle with it. The cake may lack a little sweetness. If you want to add a bit more you could use a glaze like the one from this cake. Hope that helps! Is there a way to do this verrrry good cake so that it’s a cinnamon swirl throughout rather than the two “stripes”? Hi Jane, I don’t really think you could incorporate the swirl throughout the whole cake as the extra sugar may impact the batter. You could put it in layers as the recipe instructs, but then take a butter knife and move it back and forth through the swirl to distribute it more through the cake. Please let me know how it turns out if you try it! Hi Eileen, If you scroll down beneath the step-by-step photos, you’ll find the ingredients. Hi. Can I make this in an 8 or 9-inch springform pan? Will there be enough streusel for the swirl and the topping? I’d love to make it in the 8 inch? Hi Jane, I think you could get away with an 8-in pan, but no larger. Hope that helps! I baked this yesterday for a small party on Sunday. My mother-in-law used to make something very similar. I had to taste just a sliver and it’s delicious! I’ll definitely make it again and again! Love this cake! Sometimes I add a bit of grated bittersweet or unsweetened chocolate to the nut mixture for a slightly different flavor. Keeps very well, although it never lasts long. One of my favorite breakfast goodies. Moist and flavorful with just the right amount of sweet. This cake was an immediate hit. I live right down the street from Zingermans and this cake is popular but also very expensive. This is understandable since Zingermans uses high quality ingredients. But eating this cake fresh from the oven is a sublime experience. It was popular even though I made it in the summer when most people are goo goo eyed for ice cream. It’s a bit of work and takes awhile to make but it’s worth every minute. Be sure to use the best quality ingredients because you can taste every one of them. This is a beautiful cake. I love how it holds together when you are cutting and eating it. I did reduce the sugar in the cake by 100g and I would consider reducing the brown sugar in the streusel just a little bit, but other than that, it is a perfect cake. It definitely tastes as good on day 5 as it did on day 1. Thanks for another great recipe, Jenn. Just wondering if I could use self raising four instead of the all purpose/baking soda mix? Hi, for the most predictable results, I always suggest sticking with the recipe as written (as that’s how it’s been tested). That said, if you’d like to use self-rising flour here, here are some tips for some minor adjustments you’ll need to make. I’d love to hear how it turns out if you try it! I don’t have a bundt pan. What other type of pan can I use? Hi Kelly, I think you could use a 9-in square baking pan or two 8×4-in loaf pans. Hope that helps! I’m looking for a very dense cake, not a light and fluffy one. Would this fit the bill? Hi Debby, this is definitely more on the dense side. Hope you enjoy! I made it and it was absolutely delicious. My love for sour cream forced my hand to add 2 extra table spoons to the recipe. LOL. This is my new favorite coffee cake recipe. Thank you very much. The aroma when baking is delightful. The cake was buttery and has a great texture. I followed the recipe exactly and was rewarded with wonderful results. If you read this, you have found THE best coffee cake out there. Now stop reading and go make it! This is it. My favorite! And don t you dare skipping toasting the walnut! I just made this recently and let me say, it was one of the most unfussy, delicious, and attractive cakes I have made in the coffee cake category. From toasting the nuts, to mixing the batter (and I used a hand mixer), along with baking and then, the ease of the cake coming out of my cheap bundt pan….the flavor was divine. The buttery taste, and the moist texture and ease of preparing will move this cake to the top of my most used recipes. Thank you so much for the recipe. I thought it was going to be dry because the only moisture was from the sour cream, butter and eggs but it turned out great. This is one of my favorite Jenn recipes! I have made it several times exactly as the recipe instructs and it always comes out perfectly. The only tip I can add is to use Baker’s Spray to the pan so the cake unmolds easily. This cake is amazing. I wanted to make my usual coffee cake but didn’t have enough sour cream. Searched the internet and there it was. You are a trusted source so it was a no brainer to try your recipe. It is lovely, moist and so flavourful. I also love how much it makes. Great for company or just a hungry family. A true winner! Can you use same recipe no Nuts? Sure, Linda, that will work. I’d recommend replacing the nuts with either chocolate chips – or just doubling the brown sugar in the streusel. Hope that helps! Made this coffee cake this weekend. Loved the batter. I didn’t have enough sour cream so made up the difference with yogurt. So delicious and light. My Husband loved it. This was terrific Though I’m sure it is equally good when made exactly as written, I did substitute pecans for the walnuts as folks in my family have issues with walnuts. The only downside for me is I can only make it if there will be a crowd, otherwise I’ll eat the whole cake! This Sour Cream Coffee Cake with Cinnamon-Walnut Swirl is positively fabulous in texture, taste, moist and most importantly with Jenn’s photos and showing all ingredients, one cannot mess-up! For someone like me who always looks for taste, Jenn’s recipes are easy to follow and have that elegant look. Jenn: First off I wanted to thank you for getting me started in purchasing all the needed Bundt pan and accessories to make this fabulous Coffee Cake. It turned out just like your beautiful picture and tastes Heavenly! 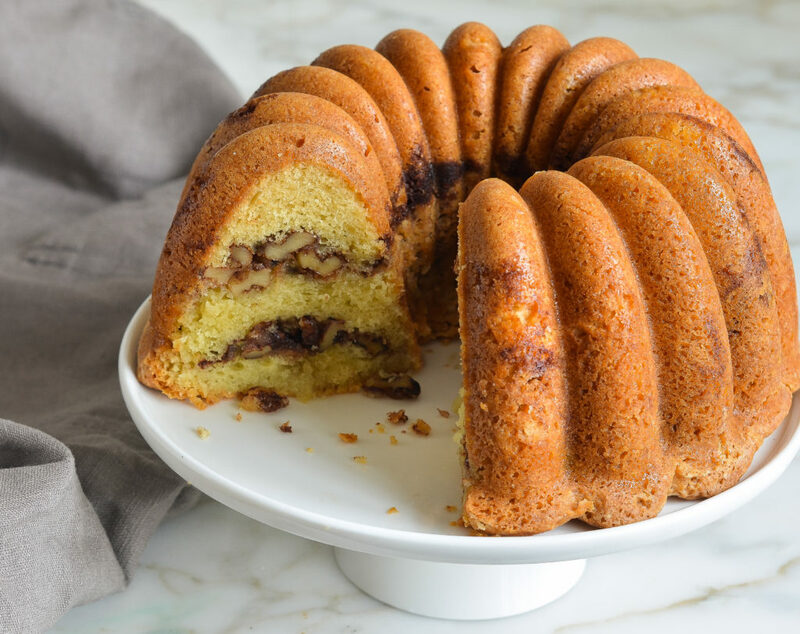 The Nordic Ware Elegant Party Bundt Pan is a must for this coffee cake and just about every other bundt. Perfect small slices. So Elegant!!! Blessings to you and your Family. Awesome Awesome !!! Made it for friends and family who were visiting from India . They were all praises for it and just devoured it. I think there is nothing more to be said about it. Can I substitute granulated sugar for brown sugar? Hi Kim, I’d stick with brown sugar here – sorry! We have a birthday group that goes back at least 15 years. I am not the baker of the group; the responsibility usually falls to someone else. I have brought the Thai crunch salad to the group in the past, and people always rave about it. But this time, I ended up with having to bring the cake! I was very tempted to buy one. After reading your detailed recipe, sour cream coffee cake with cinnamon-walnut swirl, I thought, I can do it. The cake looked beautiful when it was done. I purchase the same bundt cake pan as yours and dusted with powdered sugar and decorated it with pansy flowers. Everyone said that they loved the cake, even though, I felt it was a little dry at the bottom. I think they were being gentle with me since I am not the “baker” of the group and didn’t want to discourage me. The cinnamon/nut mixture all sunk to the bottom. Also, I think the slight dryness is because I overbaked it. Some of the reviewers said it was not done at the allotted time and so I added 5 for minutes thinking that since i am at a higher elevation (Colorado) that it would take longer anyway. I was also worried that the cake wouldn’t release cleanly. I should I have been more vigilant in checking the cake. I will try baking it again and adjusting the baking time. Fabulous, moist coffee cake. Other than adding sliced apple over cinnamon and nut mixture and sprinkling cinnamon sugar over greased Bundt pan I followed recipe exactly as written. Came out of pan very easily and looked beautiful. What was left of it after a couple of days was still very moist and delicious. Thanks for this great recipe. Cherry…I used Granny Smith apples and just peeled, sliced thinly and placed over nut mixture. I would do this again. Think it likely made cake moist still after few days. Really want to make this but don’t have any sour cream, could I substitute with yogurt or milk? Thank you in advance. Hi Fatima, I think yogurt would work, preferably Greek if you have any. Please lmk how it turns out! Not a dumb question! Yes, that would be perfectly fine. Enjoy! I made this coffee cake, brought it to 3 different homes plus mine. Nothing but wonderful comments. Wonderful flavor but be sure to grease AND flour the pan. I only greased mine and the top of the cake remained in the pan as I released it separating where the filling was. (I’ve never had this problem before). Darlene, I was having issues with that with my pan (it’s over 30 years old) and after experimenting, I found the Baker’s Joy spray works very well. I am not much of a baker but wanted to have something for company. I used spray with flour taking care to make sure I didn’t miss any spots. I did have trouble with the cake sticking when I went to get it out of the bundt pan. My cake seems lower and wider than the cake in the picture. I am thinking if I had a smaller bundt pan (and one that is a little taller) it might have come out more moist. The flavor is delicious and everyone had seconds. I used pecans, due to necessity as one guest can not eat walnuts. I would certainly make this again. Has anyone tied buttering and flouring the pan as opposed to using baking spray? Hi Mary, sorry to hear you had a problem with the cake sticking. It could’ve been caused by two things – is your bundt pan particularly old? If so, the non-stick coating may be wearing off. Also, it’s important that the cake doesn’t cool in the pan for longer than 15 minutes; if it does, the brown sugar in the streusel might stick to the sides of the pan and make it difficult to release the cake. And you mentioned wondering if the size of your bundt pan had an impact on the cake – is your bundt pan 9 or 10 inches? Either should work. Jenn- thanks. I tried putting a ‘cartouche’ over the top of the cake (which becomes the bottom when its on a plate) while it was cooking – that helped. Also, I put a thin lemon glace icing on the cake using pure icing sugar so it went hard. The cake looked even more magnificent with its thin transparent veil of icing! Would you please give info on this Bundt pan? Mine is a little darker than this. I have not been able to find one with a light, shiny surface like yours. I think it would make a better cake. Mine is in the oven right now, as I’ll be serving this cake for Easter. I’ll post a review after we try it. Thanks in advance. The rating below is just for the batter. I licked the bowl and it was scrumptious. Hi Vicki, Hope you enjoyed the cake! The bundt pan is by Nordic Ware. Here’s a link to it. Pan ordered and on the way; thanks! This cake was absolutely wonderful. My company and husband raved about it. It took the full 75 minutes to bake and I made it exactly as written in the recipe. I may experiment with it a little just to reduce the calories so that I can have it more often. Once upon a time, before Jenn, my kitchen was not managed and I was a take-out girl. Thanks to Jenn I am now preparing dishes that I never dreamed were possible for average cooks, like this world class coffee cake. Not only is it five star in taste, it is also unbelievably easy to make! Thanks Jenn, for bringing this Zingerman’s recipe to my table. Made this for my husbands birthday. I used half the sugar. It was perfect.. This is my first review but I have made many of your recipes all of which have turned out exceptional. Thanks. Hi Jen, I have made this scrumptious recipe twice in two weks! It is absolutely a keeper! Thanks so much for wonderful recipes and clear directions. The step by step photos clarify the process for a superior result. Much success on your book tour/signing. Just tried to make the cake amd it turned out great. I was wondering if I eliminate the streusel and mix in mini chocolate chips, would this work in cupcake form? If so, do I need to adjust (and by how much) the temperature and time (I’m assuming)? Thanks! Hi Cherry, Glad it turned out well! I do think you could omit the streusel and mix in chocolate chips – I’d bake cupcakes at 350 for about 25 minutes (start checking around 20 minutes…and it may take up to 30). I love all of your recipes, my favorite website! Question: I am thinking of making your sour cream coffee cake, a family member cannot eat nuts of any kind, how would it be if I made the cake omitting the walnuts? Hi Mary, Thank you – so happy you’re enjoying the site! It’s fine to omit the nuts, although I’d probably double the brown sugar mixture to make the filling more substantial. You could also replace the nuts with chocolate chips. Hope everyone enjoys! Lovely coffee cake! I served it for a St. Paddy’s Day lunch, along with your corned beef and cabbage. Everyone raved over the meal. Thanks for always making me look good, Jenn. 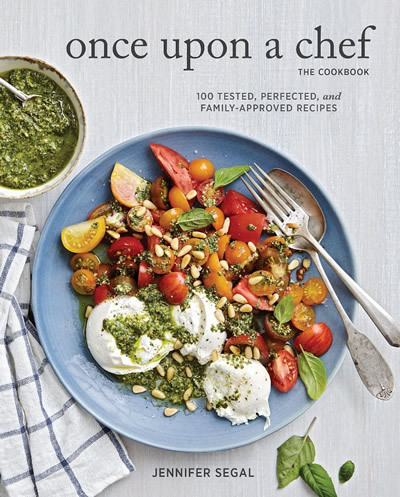 I pre-ordered your cookbook and can’t wait for it arrive! I ended up throwing the cake away. It was too sweet, and dry. I have been making a similar recipe for years that is beloved by all. Think you were in over your head with this one. Sorry! Selma- Reviewing the recipe and stating why you didn’t care for it is helpful. The “way over your head” comment sounds awfully personal, and won’t help anyone tweak the recipe who is interested in making this dessert. There are an awful lot of us reviewers out there who Jenn inspires on a regular basis. I don’t think she deserves such a mean-spirited comment. Rock on Mary! I will be sharing leadership for a dining group, hope individuals are kind in their comments. Jenn, Thanks for the great recipe. It was so easy to make and is absolutely delicious. I used half walnuts and half chocolate chips. Can’t wait to receive your cookbook to see what great things I can cook. Your recipes are the best!!! This was the best thing I’ve baked in a long time. Thanks for posting. A tip I picked up from Food52, which worked great with this, is to use sugar in place of of the flour after buttering the pan. It provides a nice crunchy topping. Excellent recipe – previously used one by Ina Garten but I love the nut mixture in this recipe more. We actually had it for dessert one night with raspberries! What a great recipe. It was delicious and easy to make. I was taking the coffee cake to work and my husband wanted to take some to work – worried there would not be any left when I came home. He loved it. Will use again and again. Best coffee cake I’ve ever had. When I was baking it for the first time I was very tempted to add some raisins …but didn’t, and after eating a piece I realized that raisins would not have made it better. This cake was DELICIOUS. I would have baked for 60-65 in retrospect. Next time I’ll weigh the walnuts and divide in two so that it’s even. Thanks! Gaat de zure room niet schiften door het verwarmen? Kan ik de zure room vervangen doór creme fraiche voor een iets minder zurige smaak? Ok had to translate that! But the answer is yes – it’s fine to replace the sour cream with creme fraiche. This cake sounds delicious! I was interested in Mary’s comment a few days ago that she added apples. If I did this, would you suggest I just add thinly sliced apples to the nut layer? I love a great Jewish apple cake. My family teases me, asking what makes it Jewish. And yes, you can bet I’ve got your cookbook on order! This was so easy to make, turned out absolutely beautiful, and I wouldn’t dream of changing one thing! Brought it to a dinner party, and everyone loved it. This sour cream pound cake is unbelievable!!! Sooo good! Thank you for such an incredible recipe! I love Bundt Cakes and this is a great recipe I added apples to mine and everybody loved it. Thank you for your great recipes. Keep up the good work. I made this a few days ago and it was scrumptious!!! This was a real hit with my family and friends! Everyone loved it. They were slightly surprised that I made it from scratch. I found that day 2 and 3 of this cake were better than fresh out the oven. I’ll be making it again this week. Absolutely awesome! Thank you for another fantastic recipe! My family loved this coffee cake. (It is so beautiful; it looks like it came from a bakery.) I left out the walnuts and doubled the brown sugar, as you suggested. It was perfect! I’m looking forward to your cookbook! Hi Jenn, if I wanted to halve the recipe for a 6 cup bundt pan, what adjustments should I make, if any. I’m assuming it will cook faster. Thanks! I made this cake yesterday for a family get together on the same day. It was super easy to make. The ingredients are not “fancy-smancy” ones that no one purchases but, rather, ones that most people that bake have in their cupboards. I only had to purchase the sour cream. The cake was incredibly rich and delicious!!! Hi Jen, Going to make this coffee cake today. Our use convection cooking and I generally reduce my temperature by 25° and the time a little bit as well. Do you have any recommendations for time and temperature? Hi Sharon, This cake bakes at such a low temp, I’d probably keep it the same and just bake for less time – I’d start checking around 50-55 minutes. Hope you enjoy it! Another excellent recipe, Jenn! I didn’t have vanilla and used coconut extract. It was sooooo goood!!! I also put a quarter cup less of sugar because I like things a little less sweet. Came out great! Hubby and daughter approved! Smile. Your recipes are so simple and hardly require changes! THANK YOU!!! Wonderful. The only changes I made were I used salted butter (instead of unsalted) and omitted the salt. I did not roast the walnuts. I also added 1 cup of coursely chopped chocolate chips. I had to bake about 90 minutes but my oven is not accurate in temp regulation. The house had such a lovely fragrance while this was baking. My family loved this. Taste and texture lovely. Thanks. Delicious cake as is – served for my family and church friends!!! Perfection! Wouldn’t change a thing. Carried well to a family cabin getaway. Didn’t last the weekend! This is a great cake. It was excellent hot right out of the pan, but it’s better when cooled. We are eating it right now for breakfast! This cake is divine.But what makes it oh so very special is the contrast of the cake and the walnut struessel. We prefer the cake warm (as soon as possible after cooking and slightly cooling), or, warmed ever so briefly in the oven before serving. Just make it and it looks amazing, cant wait to serve it tonight to the Iris Club. Thanks for the easy to follow recipe ! Make many Bundt cakes for church Fellowship hour and always found it best to grease and flour Bundt pan. Have made similar without toasting walnuts but toasting is necessary for added taste. Will definitely add to my selections. Jenn, I’ll be making this on an upcoming anniversary trip for our closest friends. We’re taking them to a cabin in Georgia and I’ll be cooking their anniversary dinner. I wanted to make a sort of rustic menu since it’s a get away from the “go-go-go” lifestyles we all live. I thought this was the perfect cake to finish dinner off with a beautiful cappuccino. However, I would love to dress this up a bit. What would you recommend? Hi Celeste, How nice! I would dust it lightly with confectioners’ sugar to dress it up – a glaze might make it too sweet. I haven’t tried this with gluten-free flour so it’s hard to know for sure, but I think it’s safe to say that you’ll have much better results using regular all-purpose flour. Maybe make two? I think I’m just going to stick with regular all purpose! Your recipes are always perfect as is and I’d hate to mess with it! Another question: Should I use I bleached or unbleached all purpose? Does it matter? Hi Celeste, either bleached or unbleached will work. Hope everyone enjoys! Read the recipe and had to make (housebound 3 ft of snow). Great flavor, and I used slivered almonds as I had no walnuts and cottage cheese with 2 tablespoons of lemon juice and 2 tablespoons of skim milk as a sour cream substitute. It still tasted fine… ! Good Morning, Your sour cream coffee cake was a huge success for a brunch that I just hosted. Definitely one of my go-to recipes! Hi Jenn, I’m looking forward to making this recipe. I don’t have a bundt pan. Can I use a 9inch round pan instead? Hi Deepa, I’d use two 8- or 9-inch round pans or a single 9-inch springform pan. Hope that helps! The fab and gorgeous Sour Cream Coffee Cake with Cinnamon-Walnut Swirl will be made just as soon as I have finished up the delish Chocolate Chunk Cookies (yet again!). 🙂 Love sour cream coffee cakes so will be so excite to make this recipe, Jenn. Hi Jen—I’m sure this is amazing as is, but I am cooking for a family member who can’t have nuts. Would leaving out nuts be a terrible idea? Thanks for all your recipes—this is my go to site for recipes that are tested to perfection! Hi Ali, I’d replace the nuts with chocolate chips or raisins — or if you’d like to just leave them out, I’d double the brown sugar so you get a more substantial swirl. Is it okay to leave out the nuts? Hi Amanda, I’d replace the nuts with chocolate chips or raisins. Or if you’d like to just leave them out, I’d double the brown sugar so you get a more substantial swirl. I’d love to know how it turns out! Hi Marion, You can use two 8-in round cake pans – and instead of two layers of streusel, I’d just do one in each pan. I would like to know if the 2 sticks of butter can be reduced or replaced with another ingredient? Hi Rosanna, I don’t recommend reducing or replacing the butter in this recipe – sorry! Yes, that’s correct Corinne. In my oven it takes the full 70 minutes; just leave it in til it’s done. Hi! My son is allergic to walnuts but loves coffee cake. Do you think I could leave out the walnuts and it still taste amazing? Hi Cecilia, I recommend replacing the nuts with chocolate chips for kids – or you can just leave out the nuts and double the brown sugar in the streusel. Hope that helps! I love this recipe but I mixed up the nuts (walnut and cashews). I grew up eating cashews so that has always been my go to nut. Sometimes I go pecans all the way. I just got a new oven, my old one was 30 years old! So am so excited to christen with this recipe,I have a bundt pan that I’ve never got to use & I have all the ingredients, only one problem, no stand mixer, do you think it would work to use an old fashioned hand mixer? That too is probably 30 years old,never been much of a baker but would love to start, especially with my new oven!Thanks. Hi Lilly, I think a hand mixer will work well. Enjoy! Americans call this type of sweet coffee cake.You drink it with a cup of coffee. No coffee in it! Yes, it is confusing. Coffee cakes are meant to be eaten while drinking coffee (or tea). Typically (althogh not always) there is no coffee in the ingredients. And, to add to the confusion, they can be eaten at any time of the day. Hope this helps. This cake is amazing–the surprise swirl makes it party-worthy. Hi there! Love your recipes. Your cake looks amazing but I have two questions for you First of all, since you use all purpose flour and no baking powder ,just soda,does the cake rise enough? Besides that what can I substitute sour cream for? I live in Greece and it’s something I can’t find here.I realize it’s called sour cream cake but…Thanks in advance. Hi Vivi, Yes it rises beautifully with only baking soda. And instead of the sour cream, use full fat Greek yogurt. Please let me know how it turns out! Jenn, I love your recipes and website! Your chocolate chip coffee cake has become such a staple in our house that it’s truly a tragedy when we run out. 🙂 And. . . that NY cheesecake and berry sauce that you posted a few weeks ago left us speechless. Absolutely divine! I’d like to try the cinnamon-swirl coffee cake, but one of our family members has a nut allergy. Could you recommend another crunchy alternative for the streusel? Or could I just omit the nuts and include the cinnamon/sugar mix instead? Thank you! Hi Arianna, I think chocolate chips would work beautifully. Or if you’d like to just omit the nuts, I’d double the brown sugar so you get a more substantial swirl. This look wonderful and I cant wait to try it. If I used low fat sour cream would it really ruin the cake? Excellent — and very easy — coffee cake. The only thing that I’d add would be a sprinkling of confectioners sugar for a simple dress-up. LOVE all of your recipes, Jenn! Jen, can I make this in a 9-ich springform pan or a n 8 inch square baking pan? Also, any reason to not use gluten free flour. ( i like Red’s Mill for baking). Hi Kate, I’d go with the 9-inch springform. I can’t say for sure how the gluten-free flour will work since I haven’t tried it but another reader mentioned she had good results. I’d love to know how it turns out! I plan on making this cake soon. In the quest to reduce calories without sacrificing too much flavor/texture, could a lower fat or nonfat sour cream be substituted? I think this would still work nicely with low-fat sour cream. Hope you enjoy! Add chocolate chips and this is Ruth Tieg’s Famous Coffee Cake from My Grandmother’s Ravioli! I wonder who had it first! This looks great and will taste great! This cake was divine, in looks and a blast of flavour. As if it weren’t delish enough – the only thing I could think to add that help it look more festive is a white sugar glaze. I absolutely love your posts, Jennifer. Looking forward to receiving my cookbook. I have made several recipes from your website and every recipe was outstanding! Also, I love the bundt pan you are using, it makes for a pretty presentation. Would you mind sharing where you purchased it? Thank you for your delicious & thoughtful recipes! Hi Renée, You can find the pan here. I love it too! So happy to get this recipe again! I remember my mother making one similar. The only difference was chopping the walnuts more finely and adding a layer of thinly sliced green apple with the nut layers. Thanks!